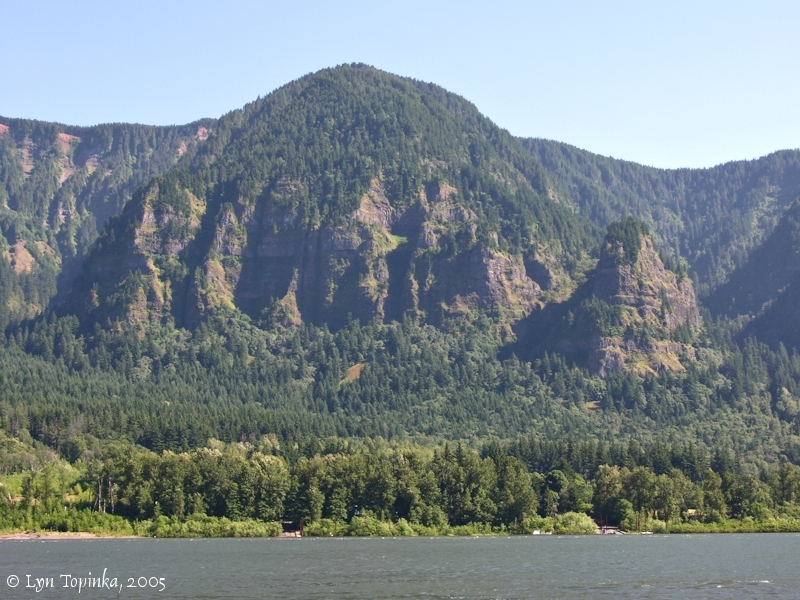 "Yeon Mountain, Katanai Rock, St. Peters Dome, and Rock of Ages, Oregon"
Click image to enlarge Yeon Mountain, Katanai Rock, St. Peters Dome, and Rock of Ages, Oregon, from Skamania Landing, Washington. Image taken June 29, 2005. 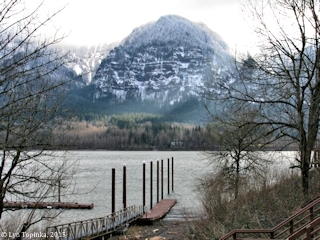 Yeon Mountain, Katanai Rock, St. Peters Dome, and Rock of Ages are all located on the Oregon side of the Columbia River at River Mile (RM) 140. At their base lies the small community of Dodson. 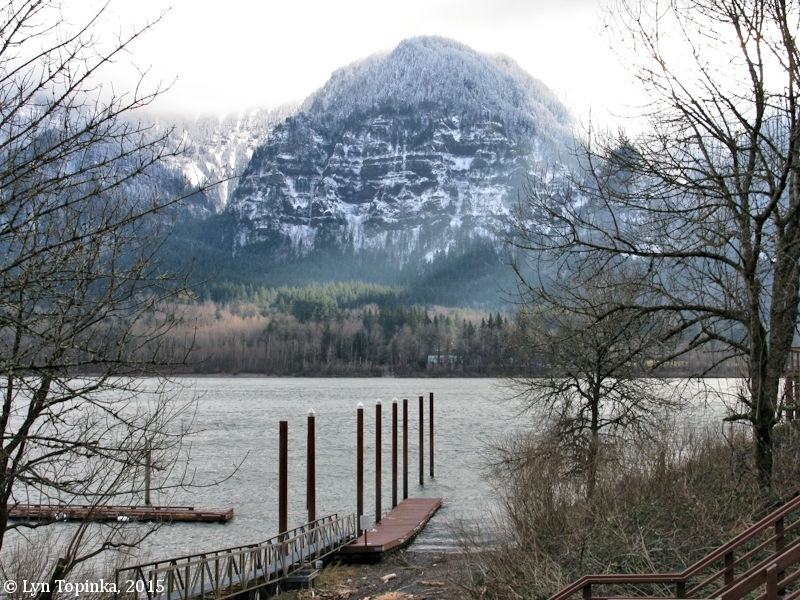 On the Washington side of the Columbia lie Franz Lake National Wildlife Refuge and Skamania Landing. Yeon Mountain was named for John Baptiste Yeon who came to Oregon in 1885. John Baptiste Yeon was a "rags to riches" story, beginning his Oregon career as a logger, and ending it as a prominant Portland citizen. He was among those who promoted the Historic Columbia River Highway. The John B. Yeon State Park, east of Yeon Mountain, was also named to honor him. Originally rounded Yeon Mountain was called "St. Peters Dome", with the tall basalt feature to the west being called "Cathedral Rock". Today's the name "St. Peters Dome" has been applied to this tall basalt feature. It was first climbed in 1940 when a party of six reached its summit. To the west of Yeon Mountain and St. Peters Dome is another basalt feature called "Rock of Ages". Originally rounded Yeon Mountain was called "St. Peters Dome", with the tall basalt feature to the west being called "Cathedral Rock". Today's the name "St. Peters Dome" has been applied to this tall basalt feature. In 1915 a joint committee from the Oregon Historical Society, Oregon Geographic Board, and the Mazamas, at the request of the United Highway Commission, suggested new names and renaming of places along the newly completed Columbia River Highway. This list was submitted to the United States Geographic Board for the final approval. "Katant Rock" was suggested for today's "Katanai Rock". "Leveens Creek" today is an un-named creek (according to the U.S. Board of Geographic Names) which drains the "gully" between St. Peter's Dome on the west and Yeon Mountain on the east. It is approximately 1.5 miles in length. Robert A. Habersham's 1889 Multnomah County map shows this creek with it's mouth named "Leavens Slough". According to the U.S. Bureau of Land Management's General Land Office Records (GLO) database (2014), on October 1, 1869 Hiram A. Leavens was given title to 149.84 acres of T1N R6E, parts of Sections 2 and 3, and T2N R6E, parts of sections 34 and 35 (1862 Homestead EntryOriginal). St. Peter's Dome is a basalt spire west of Yeon Mountain and, at one time, was referred to as "Cathedral Rock" or "Cathedral Point". According to "Oregon Geographic Names" (McArthur and McArthur, 2003), St. Peter's Dome use to be called "Cathedral Rock". "... 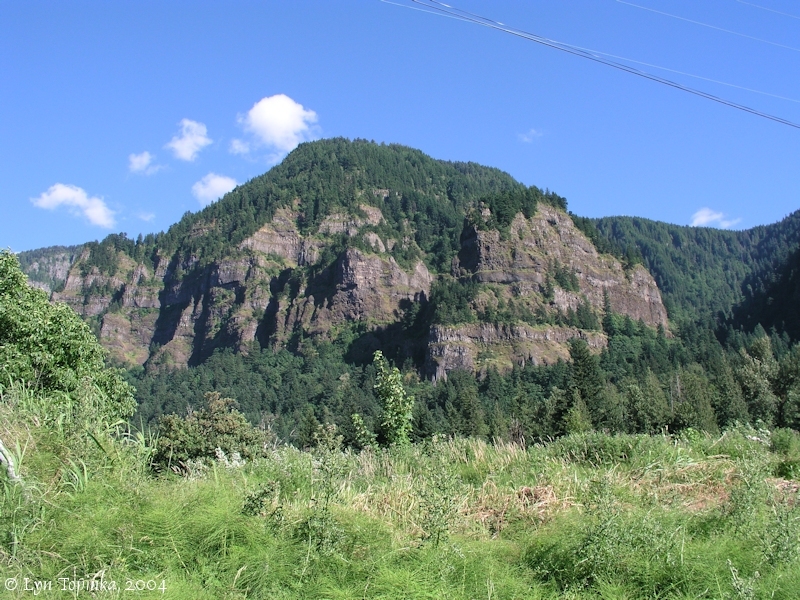 This basalt monolith in the Columbia Gorge near Dodson was a conspicuous challenge to the mountain-climbing fraternity for many years. In 1940, it was first climbed by Joe Leuthold and five others, including a woman, Ida Darr. In early days, this was called Cathedral Rock and the name Saint Peters Dome described the higher summit to the south now called Yeon Mountain. ..."
"... HORSETAIL FALLS, 156.6 m., forming the design that gives it name, shoot downward across the face of the sheer rock wall into an excellent fishing pool. Spray from the pool continually drifts across the highway. East of the falls towers ST. PETERS DOME, a 2,000-foot basalt pinnacle. 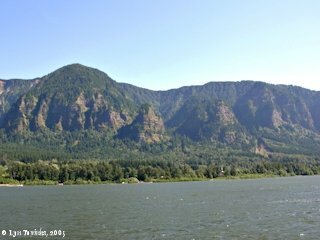 ..."
On the Washington State side, good views of Yeon Mountain, Katanai Rock, St. Peters Dome, and Rock of Ages can be had from Skamania Landing. 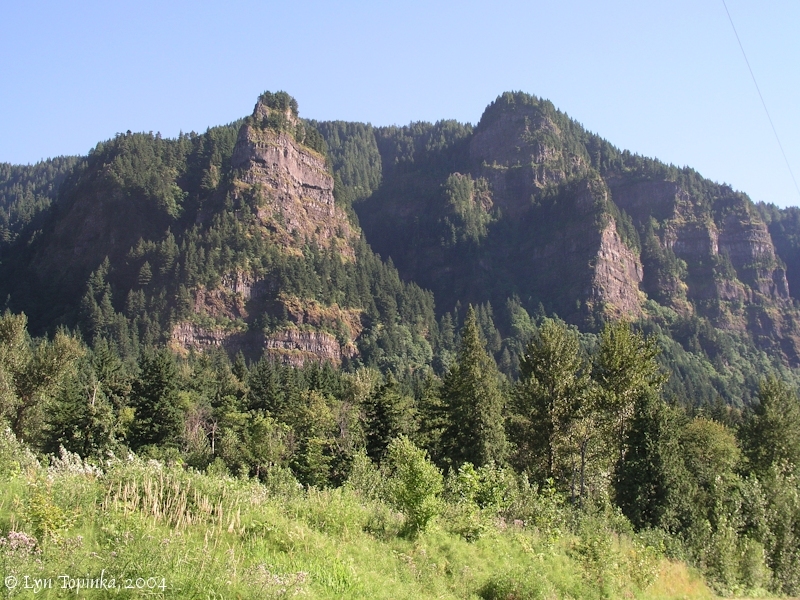 On the Oregon side, good views of can be had from the roads around Dodson. 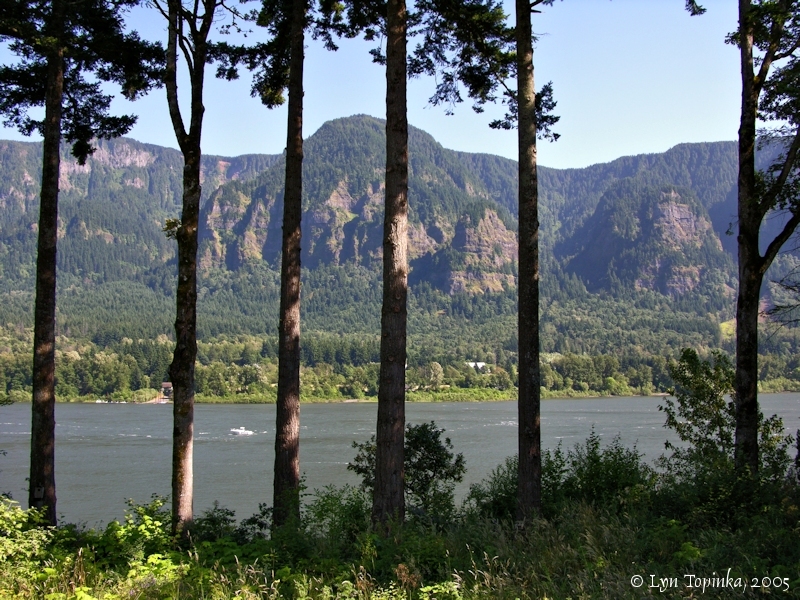 Nice views from the west can be seen from the area around Oneonta on the Historic Columbia River Highway. 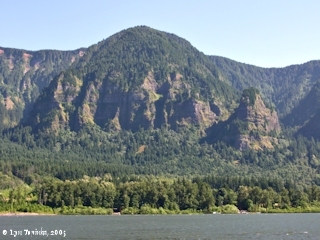 Click image to enlarge Yeon Mountain and Katanai Rock, Oregon, as seen from Skamania Landing, Washington. Image taken June 29, 2005. 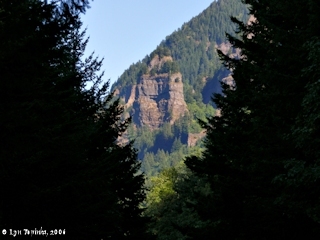 Click image to enlarge Yeon Mountain and Katanai Rock, Oregon. View from off of Interstate 84 from near Dodson, Oregon. Yeon Mountain was at one time called "St. Peter's Dome". Image taken June 27, 2004. 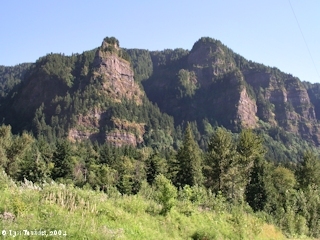 Click image to enlarge St. Peters Dome (left) and Rock of Ages (right), Oregon. View from off of Interstate 84 from near Dodson, Oregon. Image taken June 27, 2004. Click image to enlarge Flanks of Yeon Mountain with Katanai Rock, with St. Peters Dome on the right. 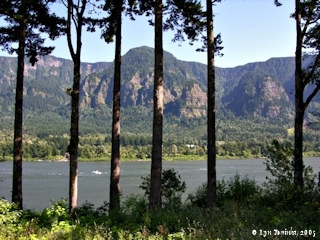 View from Oneonta along the Historical Columbia River Highway. Image taken September 23, 2006. Click image to enlarge St. Peters Dome as seen from Oneonta. 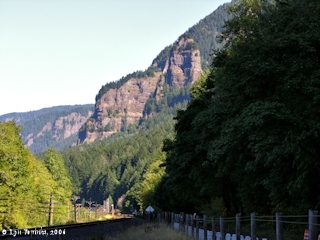 View along the Historical Columbia River Highway. Image taken September 23, 2006. 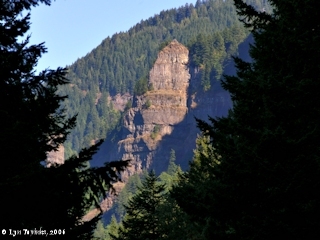 Click image to enlarge Rock of Ages spire west of St. Peters Dome as seen from Oneonta. View along the Historical Columbia River Highway. Image taken September 23, 2006.